Ahead of Record Store Day on Saturday (April 21st), chocolate lovers will be singing a new tune when Kellogg’s Chocolate Frosted Flakes hits bowls and playlists with the first record to ever be made out of actual cereal. After listening to the new release, “Hello” from Simon Cowell-backed boy band PRETTYMUCH, you can enjoy the sweet taste of Chocolate Frosted Flakes by consuming the record. The delicious, vinyl-inspired record features a core of Chocolate Frosted Flakes, topped with layers of milk and dark chocolate. 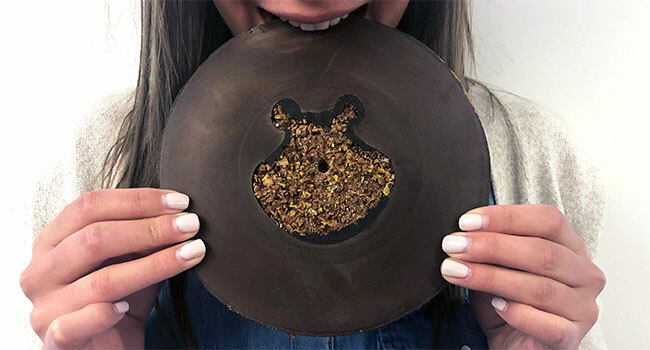 Pressed in a 3D-printed mold to create playable grooves, the limited-edition record features a silhouette of Tony the Tiger, to showcase the crunchy, chocolatey Chocolate Frosted Flakes. Sweetening the record beyond its cereal recipe is the song it features, the new release “Hello” by PRETTYMUCH, an iHeartRadio 2018 Best Boy Band nominee. For the full Chocolate Frosted Flakes experience, fans view an exclusive “Hello” music video featuring Tony the Tiger on PRETTYMUCH’s YouTube channel, and take the dance party on the go by downloading the song on iTunes. “Through our music, we’ve always advocated for having fun and living your greatness in everything you do ’cause it’s just so important to stay true to yourself and have a good time doing it! So, we thought, what better way to do that than release our newest song on the first ever record made of Chocolate Frosted Flakes,” shares Brandon of PRETTYMUCH. Select fans who registered with PRETTYMUCH in advance will be the first to receive the record and have the chance to meet the band in person at Kellogg’s NYC café. Starting Friday (April 20th), all fans can pick up the Chocolate Frosted Flakes record for free at the café, while supplies last. A limited number of the collector’s item will also be available in Chicago on April 21st at Reckless Records’ Wicker Park location, in honor of Record Store Day. Unlike other chocolate cereals, Chocolate Frosted Flakes’ flavor is just that – frosted – onto the corn flake base, providing a distinctly chocolatey taste while maintaining a satisfying crunch. Kellogg’s worked directly with fans to test how different cocoas interact with balancing notes on the cereal flake and in the milk left at the bottom of the bowl.